Leonardo whats-his-name, Herman Munster motorcade, birthday party, Cheet-ohs, pogo sticks and lemonade, idiotic stupid jerk…that’s right, Flanders, I’m talking about you. Now that Ben has his own kitchen, I had the idea that I could start converting some US recipes for him. I wanted to start with a family favorite, Chocolate Crunch Bars (more aptly called Oatmeal Fudge Bars, seeing as they do not crunch). These have a soft oatmeal cookie base and with a fudge layer on top, and they are made of yum. I had the brilliant idea that I could convert this first recipe by Ben’s birthday. Well, talk about in under the wire: HAPPY BIRTHDAY, BEN! 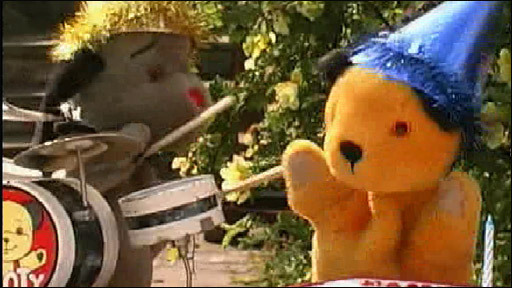 Sweep says happy birthday, too! Converting a US recipe for use in the UK mainly means switching over to metric and changing volume quantities to weights. But I also wanted to make the recipe using ingredients easily obtained there. Most of these changes were pretty simple, but I ran into a roadblock with sweetened condensed milk. 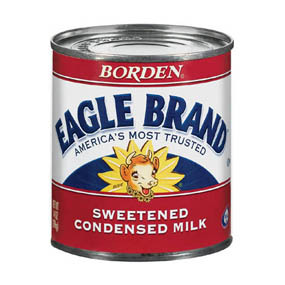 Condensed milk is a well-recognized ingredient here, often referred to by brand name — my handwritten version simply calls for “a can of Eagle Brand”. But I know Eagle Brand isn’t in every shop in England, so I started seeking a substitute. My first go replaced Eagle Brand with an egg-sugar concoction. It worked just fine, but the texture didn’t match the original. The chocolate layer was gooey rather than fudgy. I took a batch to work. Co-workers reported back all day. “OMG, CHOCOLATE GOO GOOOOOOOD” read one email. Other people stopped by. “You have these down to an art,” my boss mumbled through a mouthful. 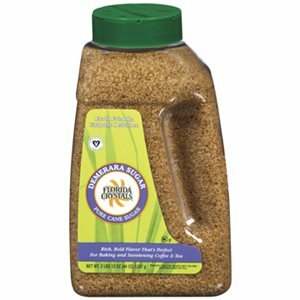 Demerara sugar — a type of brown sugar now available in the US. Sigh. Back to the food science lab! The second go-around, I used evaporated milk, demerara sugar and flour. I think I threw in an egg as well. Even though evap and condensed milk both have about 60% of the water content removed and both are full-fat dairy products, the evaporated milk mix was very runny. The chocolate topping ran down the sides of the oatmeal base. It set up ok in the oven, but the finished product had a new middle layer of oatmeal/chocolate. The whole confection was moist but crumbly, rather than being a unified slab. “Yes, this phase of the experiment wasn’t very successful,” I said. …success! So here it is in both versions (and if you want the gooey version, replace the powdered milk/sugar or sweetened condensed milk with the eggy mixture found here; melt everything separately and then stir in the egg stuff). Mix together the milk and hot water until liquid; add the sugar and stir a lot. Set aside. Cream the butter and sugars. Add eggs and stir until blended. Add bicarb, salt and flour and stir until blended. Add oatmeal and stir until blended, which will not be super easy, but persevere. Reserve a big handful of the mixture, and spread/press the rest into a big rectangular pan that I would call a 9×13 pan. Something you’d cook a lasagne in, perhaps. Throw all this stuff in a bowl and melt it in the microwave (about a minute). Stir until completely blended, and pour over the oatmeal base. Crumble the reserved oatmeal stuff over the top. Bake at 175C for about 30 minutes or until the crumbled parts are golden brown. Cream the butter and sugars. Add eggs and stir until blended. Add soda, salt and flour and stir until blended. Add oats and stir until blended, which will not be super easy, but persevere. Reserve a big handful of the mixture, and spread/press the rest into a 9×13 pan. Throw all this stuff in a bowl and melt it in the microwave (about a minute). Stir until completely blended, and pour over the oatmeal base. Crumble the reserved oatmeal stuff over the top. Bake at 350 for about 30 minutes or until the crumbled parts are golden brown. 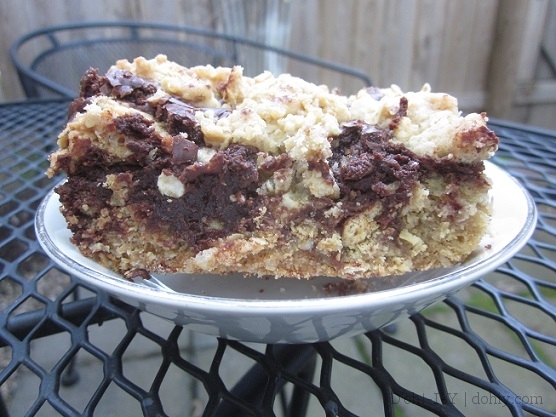 This entry was posted in American vs English, Family, Food & Drink and tagged dessert, oatmeal fudge bars, picnic bars, US to UK recipe conversion. Bookmark the permalink.